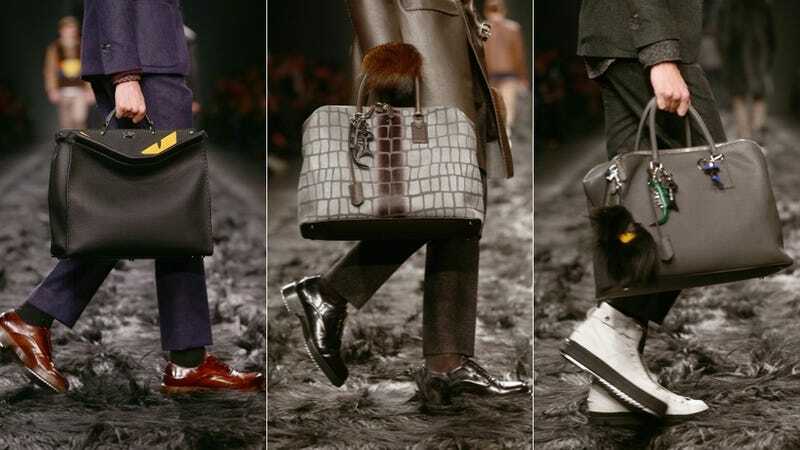 Well, I guess this is one way to get people talking: at the Fendi fall '14 menswear show yesterday in Milan, the runway was covered in a thick layer of dark fur. "Faux, I hope," wrote Matthew Schnieir of Style.com on an Instagram photo depicting some tasteful leather sneakers mid fur-stomp. Sadly, it seems like it's not — both WWD and Italian blog MF Fashion are reporting that it's goat. Fendi is no stranger to the ridiculous overuse of fur — the company's FF insignia did originally stand for "fun furs," after all, and the company is renowned for using fur in innovative and experimental ways (the fox fur mohawk wigs and sunglasses of fall 2013 come to mind as especially insane) — but a goat fur runway really takes the wanton overuse of animal products to the next level. According to one reviewer, "The catwalk contained so much goat that by the end it looked like a mucky pavement." Gross.